For the rest of this week, Robohub will have a special focus on the use of robots in warfare. All kinds of robots are being developed for strategic defence and military action (in space, in the air, underwater and on the ground). 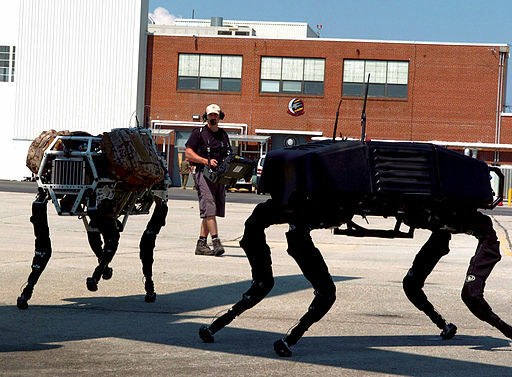 At Robohub we’ve had the opportunity to cover a wide range of them, including exoskeletons, transport mules such as Big Dog and DARPA’s LS3, and video reconnaissance systems such as iRobot’s Packbot. But by far the most talked about military robotics technology is the UAV. Whether you call them drones or unmanned aerial vehicles, almost everyone‘s got one. According to the US Government Accountability Office, seventy-six countries now have drone technology, though not all are armed. Since we launched this past August, Robohub has scooped a number of stories on who’s got UAV technology and who’s using it for military purposes (including the US, China, Australia, Europe, and others). And while there are many kinds of stakeholders with an interest in the technology (including police, surveillance, film, the hobby market, and search and rescue), military organizations are clearly the big spenders driving the market. Those who are against the use of war zone robots, arguing that they are unregulated and that little attention is being paid to moral implications and international law (see Noel Sharkey’s Robot wars are a reality, and PBS Nova’s Rise of the Drones). And those who are for using UAVs in war zones, arguing that drones kill fewer civilians than other modes of warfare (see Ron Arkin’s Governing Lethal Behavior in Autonomous Robots, and the New York Times article The moral case for drones). On Robohub, Sabine Hauert’s insightful Robots and Ethics podcast elegantly captured both sides of this debate, and Mike Hamer also explored the ethics in his opinion piece Losing Humanity. But there is also a third perspective out there: that UAVs and drones can be a whole lot more than killers and spies (see for example, Ryan Calo in Bad laws would hurt good drones, Time Magazine’s Why we shouldn’t fear personal drones and What happens when drones return to America, Motherboard TV’s Drone On, and Journey Man Pictures’ Rise of the Machines). Robohub contributor Eric Wind has also pursued this perspective. In response to the Robotics by Invitation question “How will robots shape the future of warfare?“, Raffaello D’Andrea talks about the ethics from a researcher’s perspective, Daniel H. Wilson discusses the widespread use of drone technology, and Mark Tilden questions the morality of blame-free robotic conflict. Read more. Former US Army Officer and unmanned systems expert Robert Morris argues that ethical debate is a red herring, and that the real issue is about policy and who is the true leader in battle. Read more. Chris Mailey from the Association for Unmanned Vehicle Systems International (AUVSI) urges us to look at military history to better understand how robots will shape the future of warfare. Read more. Longtime Robohub contributor and UAV enthusiast Ioannis Erripis gives us an overview of the kinds of robots that are being used in the military today. Read more. And finally, Jim Haas, creator of Nate the Robot, will be issuing war-themed comics for the rest of this month. Look for them in the sidebar! We hope that you find this focus series provocative, and we look forward to your comments.